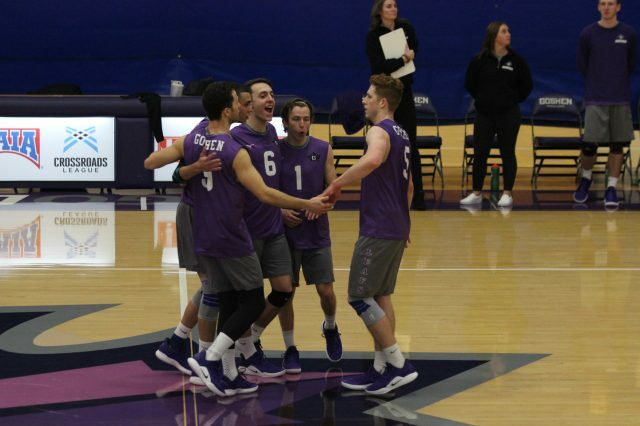 The Goshen College men’s volleyball team hit the road in their second match of the season on Friday, Jan.18, traveling to Trinity Christian College in Palos Heights, Illinois. The team, coming off of a home loss to Lawrence Technological University, came out ready to avenge their loss. In the first set, the Maple Leafs jumped out to a quick 11-6 advantage. The Maple Leafs held onto that lead until it was tied at 20 a piece. The Maple Leafs would take the Trolls all the way down to the end but could not hang on. They dropped the first set 23-25. In the second set, the Maple Leafs would trail until achieving a 6-6 tie. Then the Maple Leafs would distance themselves after a 10-4 run to give them a 16-10 advantage. The Trolls would respond and close the gap to four at 18-14. That was the closest the Trolls would come in the second set. The final score of the second match was Maple Leafs 25, Trolls 16. The Maple Leafs tried to carry that second set momentum into the third set, but the Trolls had other ideas. This set was neck and neck to the 16-16 mark. Then the Trolls would score four of the next five points to take a 20-17 lead. The Maple Leafs got close at the end, cutting the margin to one at 23-24, but the Trolls were able to close them out and pick up the third set, 25-23. In the fourth set, the Trolls would look to putaway the Maple Leafs. They took a 10-6 lead and would not look back. They would take the fourth set 25-15. The Maple Leafs were led by first-year Alexander Rabadzhiev with 15 kills. The Maple Leafs fall to 0-2 on the season. The Men’s team resumed action this Tuesday when they took on third-ranked Lourdes University at home.